The Anacondrai were one of the five Ninjago snake tribes. Find out all about them and the Ninjago sets which include Anacondrai. On this page we'll take a look at the Anacondrai snake tribe from Ninjago and it's most prominent (well only!) member Pythor P. Chumsworth. 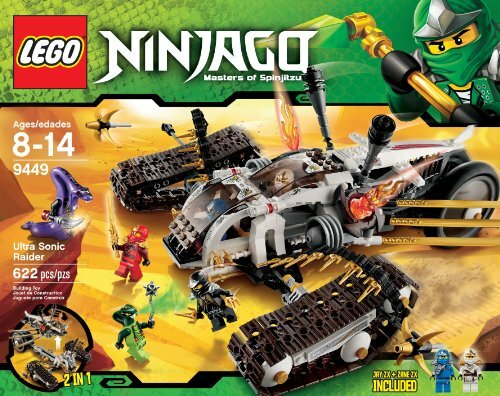 We'll also take a look at Anacondrai themed Ninjago sets, the first of which appeared in summer 2012. The Anacondrai were the biggest snake tribe. They are able to turn invisible (sneaky.) It is said that the Anacondrai were all locked in a single room without food, and only Pythor P. Chumsworth survived. Although Pythor is the last of his tribe, he makes sure that the Anacondrai cause plenty of trouble for the Ninjas. First he works with Lloyd Garmadon and then other snake tribes. He leads all the snake tribes. Pythor is intelligent and manipulative. Pythor is a large minifigure - you can see him above next to other Ninjago minifigures. He's a big purple snake with a long tail - the Ninjago snake tribe generals have a snake tail rather than legs. Pythor also has a long snakey neck. His head has a wide open mouth with fangs. The minifigure has black detail on the front of the body. Above you see him pictured with a Fang Blade - he's trying to collect them all the free The Great Devourer. You can find the Pythor P Chumsworth Minifigure in the Summer 2012 Ultra Sonic Raider set. The Ultra Sonic Raider is a big flying ninja vehicle equipped with lots of snake-fighting weapons. The set comes with 6 minifigures. You get the ZX versions of all four original ninjas: Cole ZX, Jay ZX, Kai ZX, Zane ZX. You also get the Venomari Spitta, and of course our friend Pythor P Chumsworth of the Anacondrai snake tribe. At time of writing an Anacondrai staff has not yet appeared in any of the Ninjago sets. The other four golden staffs have all appeared. They have powers heal against snake attacks from the corresponding tribe. Pythor is searching for the four fang blades which will free The Great Devourer. The Fangpyre fang blade is included in the Ultra Sonic Raider set which also includes the Pythor minifigure. The Venomari are one of the 5 snake tribes of Ninjago. Find out all about them and which sets you can collect Venomari minifigures and spinners in. The Fangpyre snake people feature in the Ninjago 2012 Rise of the Snakes theme. Find out all about them and how to collect Fangpyre minifigures and spinners. The Constrictai are one of the five snake tribes of Ninjago who have returned to challenge the ninjas. Find out all about them and which sets they are in. The Ninjago Hypnobrai snake tribe are one of the five Serpentine peoples of Ninjago. Find out all about them and where to collect Hypnobrai minifigures and spinners. In 2012, there are new Ninjago spinners for the Snake enemy and the new ZX, Kendo and NRG costumes for the heroes. New Ninjago spinners comes out throughout the year. There are new Ninjago booster packs being released throughout 2012. The Spinjitzu boosters are a cheap way to get some cool new Ninjago minifigures and weapons. Do you know kids who like Ninjago? They'll love a Lego Ninjago alarm clock. Choose from Kai and Cole. A selection of Ninjago T-Shirts featuring Kai, Jay, Cole, Zane, Sensei Wu and their enemies. What do you think of Pythor P. Chumsworth? I don't no the symbol for the anacondrai.